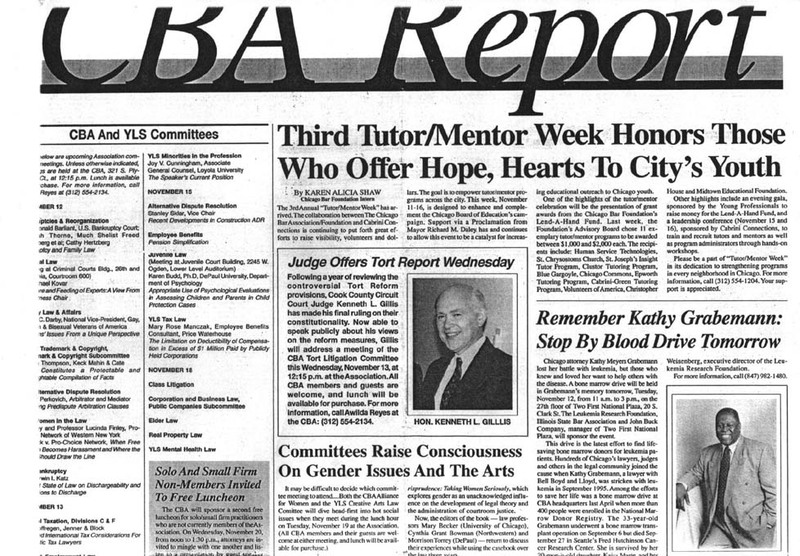 For nearly 35 years I've been collecting information about volunteer-based tutor/mentor programs, why and where they are needed, and how they can be supported consistently by business, faith, professional and philanthropic groups. 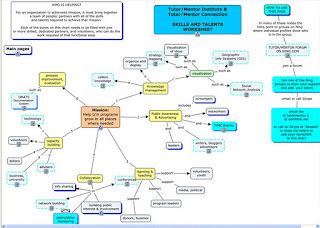 I share this via the Tutor/Mentor Institute and Tutor/Mentor Connection web libraries and the Tutor/Mentor Program Locator maps. While more than 800,000 visits and six million page views have been recorded since 1998 by people from all over the world, I also share information from this library in monthly email newsletters and via the May and November Tutor/Mentor Conferences held in Chicago. The November 2011 eNews was sent this morning to about 3,000 people and can be viewed at this link. If you want to help kids in poverty move through school and into jobs and careers or increase volunteer and philanthropic involvement from your company, faith group or family, the articles I point to can be used as group reading and reflection. This graphic illustrates that the information we collect and share on our web sites can be used by numerous groups of people in Chicago and in every other part of the world. Take a look at blogs written by interns and volunteers and how they share what they are learning from this information. You don't need to be in Chicago to do this type of learning and communications. Just join the Ning group and offer your talent. If you want to subscribe yourself or others to the newsletter, click here. If you can become a sponsor, investor, partner, intern or volunteer to support this strategy read more at this link. 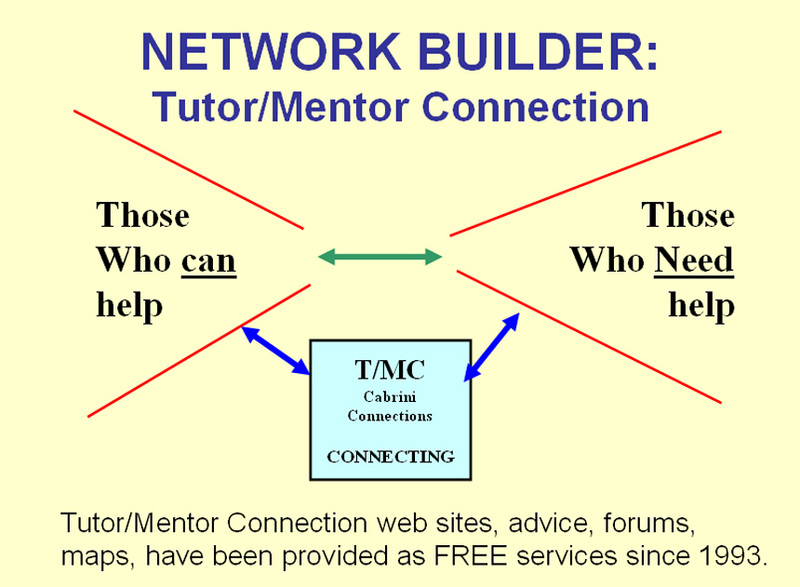 I've used this graphic for many years to illustrate the role of the Tutor/Mentor Connection as an intermediary connecting those who need help (non school tutor/mentor programs and the young people they serve) and those who can help (business, volunteer, donor, etc). From 1993-2011 I did this role as a non-profit and did not charge a fee to either side to support my services. 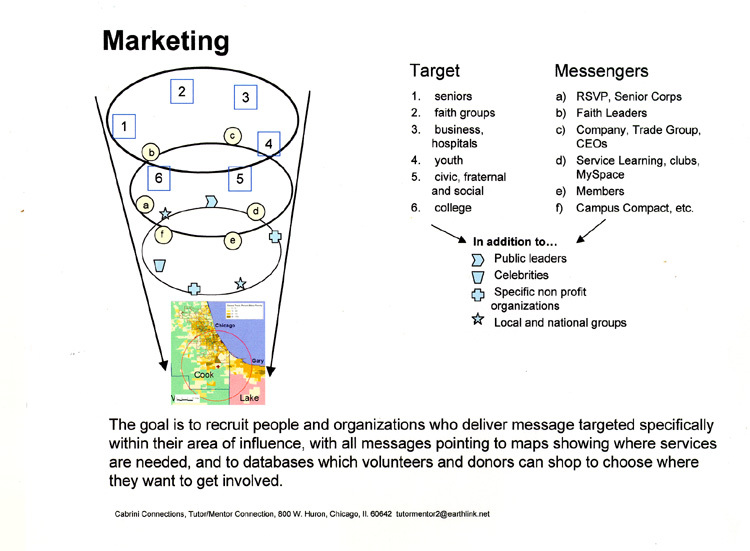 Furthermore, I built an extensive map-based information system and a year-round schedule of activities intending to draw volunteers and donors DIRECTLY to individual tutor/mentor programs the same way advertising draws customers to retail stores. Let the zip code and the web site of the program provide information the volunteer, donor, parent use to decide about getting involved. In recent years I've seen the growth of consulting firms who "tell you how to do it" but leave you without the manpower, talent and resources to apply their ideas. 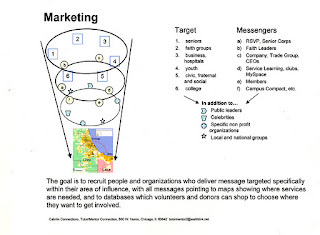 I have seen very few consultants acting like the T/MC, using their articles and blogs to draw volunteers and donors directly to the organizations they are trying to help. A few days ago I saw an article on Facebook titled "The Philanthropic-Consultant Industrial Complex . . . editor notes issue #74". I was not able to comment at that time. Then today as I read Charles Cameron's introduction to a Social Edge forum discussion titled Philanthropic Advisers: Experts in Successful Generosity, I saw a link to a blog by philanthropic consultant, Lucy Bernholz, titled The Business of the Business of Good which pointed me back to the original article that I'd seen on Facebook! I think the intermediaries like philanthropic advisers can be a good thing. 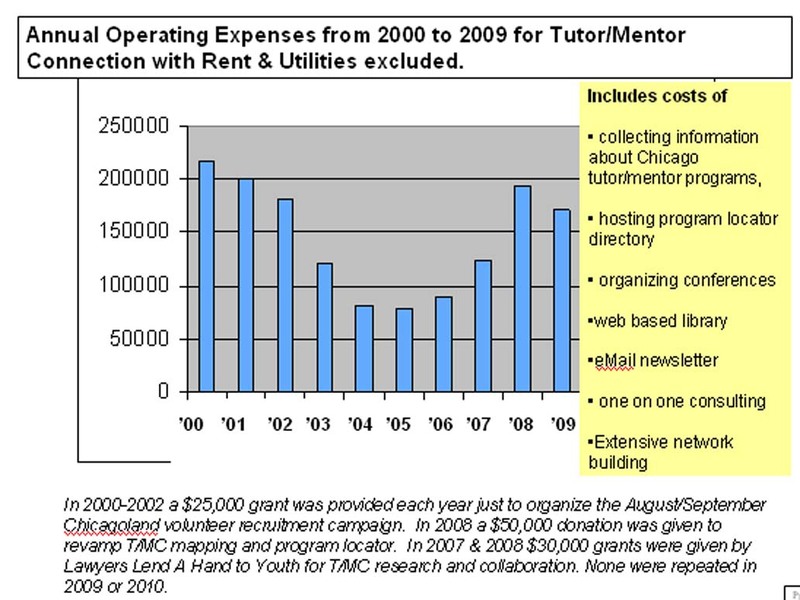 I was given $50k in late 2007 to rebuild my mapping capacity because an advisory was doing research on funding tutor/mentor programs in Chicago and he came to me for information. As I showed him how to use the Program Locator to find programs in the West part of the city I said "If your donor really wants to make a difference, give me some money to rebuild this capacity." He did. I never would have connected to this donor otherwise. However, the opposite side of this conversation is that I don't think the consultants and experts, including researchers, are doing enough to drive needed operating resources and talent directly to all of the small and mid-size places who need flexible, on-going resources to build talent, knowledge, experience and human capital within their organizations. Without this there are too few programs reaching too few kids. Due to my inability to connect consistently with enough philanthropic investors over the past 18 years I've not been able to maximize the potential impact of the Tutor/Mentor Connection. 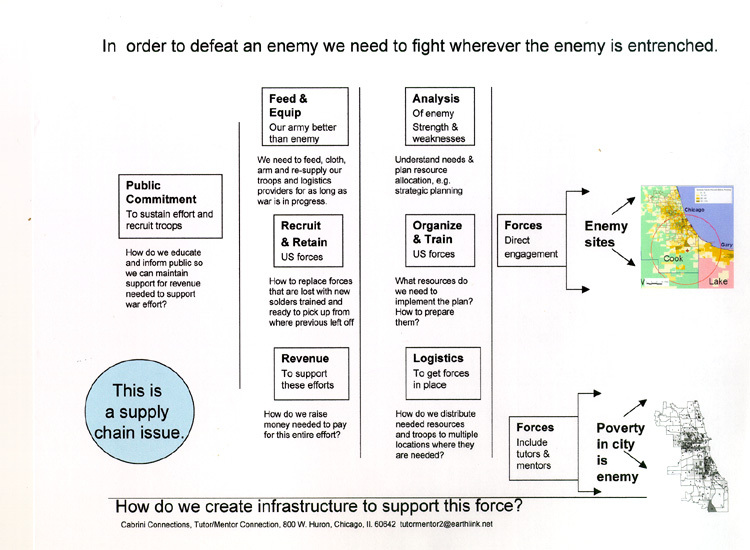 In the end the strategy was dropped in April 2011 by the Board of Directors at Cabrini Connections. I had to create Tutor/Mentor Institute, LLC in July 2011 in order to keep the T/MC going. I've always been a consultant, but I gave all my ideas away for free. Now I'm trying to find ways to get paid for sharing some of these ideas. Part of my strategy is to earn consulting fees from cities, businesses and others who want to duplicate the T/MC concept in their own cities, without the costs of starting from scratch. I'm committed to finding the dollars and talent to do this, but will never change from the philosophy of using my own time and talent to draw needed resources to the programs on the front lines of the war on poverty who must have these to win. I encourage you to follow these discussions over the coming weeks and think of ways you can be an intermediary who connects "those who can help" with "those who need help". 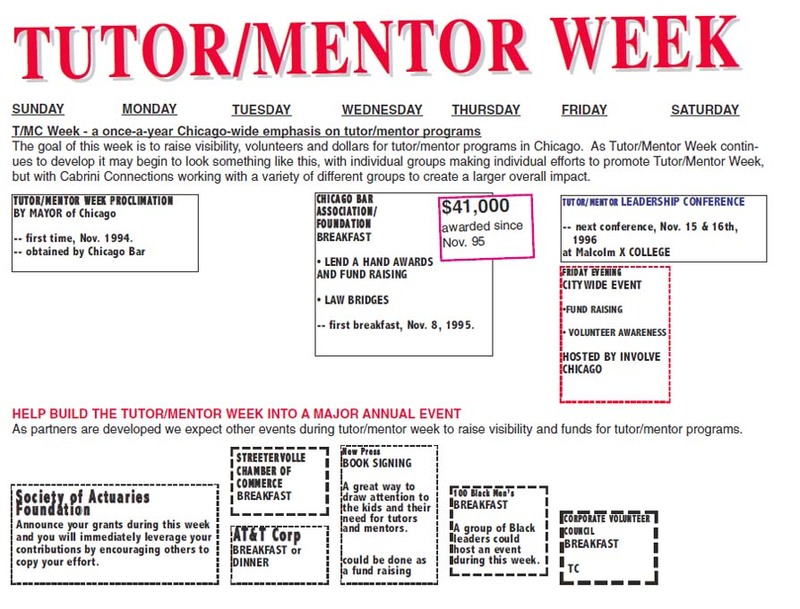 From July 2007 through April 2011 the Tutor/Mentor Connection was fortunate to have four graduates from Northwestern University serve one-year fellowships supporting the two-part strategy of Cabrini Connections and the Tutor/Mentor Connection. Each of these students were asked to build an understanding of the Tutor/Mentor Connection and share that in blog articles they wrote while also writing stories to support the youth and volunteers of Cabrini Connections. This concept map was created by Chris Warren at the close of his 2008-09 year of service. He diagramed the stories he wrote and divides them into "local" Cabrini Connections and "global" Tutor/Mentor Connection. Click this link and go to the live map and read stories Chris wrote. 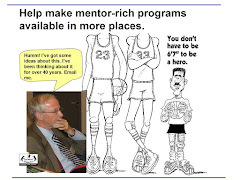 The four part strategy of the Tutor/Mentor Connection was 1) to collect information about tutor/mentor programs and why they are needed; and 2) increase the number of media stories and public attention focusing on these programs. We've organized conferences, volunteer-recruitment events and a number of other activities to do this. This Chicago Tribune article from 1994 illustrates this goal. One way we've generated media attention is by organizing an annual volunteer recruitment campaign each August since 1995. At its peak 150 organizations were participating in volunteer fairs all over the city. Mrs. George Ryan was the honorary chair for the campaign in 2000 and 2001 and Chicago Public Schools CEO Paul Vallis was a speaker at the press conference kicking off the campaign. Another way we've tried to draw attention to programs is by doing site visits and then writing articles about the programs on blogs. This list has links to stories about many different programs. If you forward this list of stories to friends, family and co-workers some may choose to send holiday donations to one or more of these programs. That's our purpose in doing this. 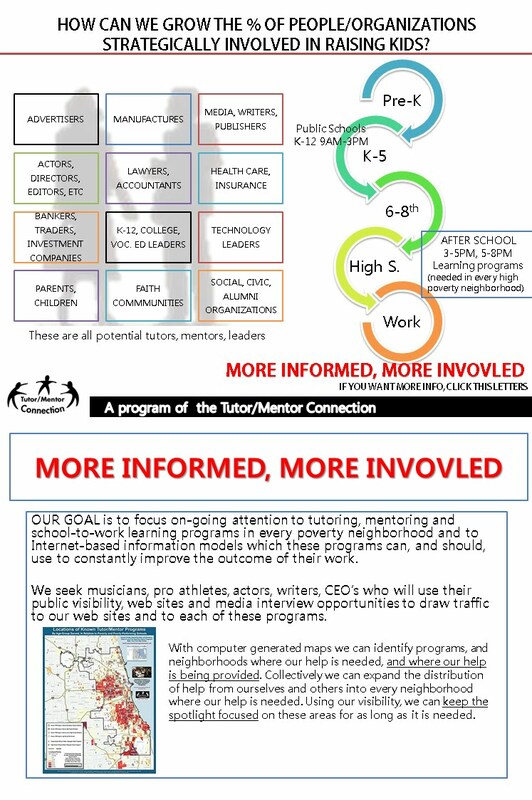 However as you look at this we also want you to look at the Talent Needs of the Tutor/Mentor Institute, LLC and the Tutor/Mentor Connection. We have not had the money to keep our NU fellowship in place or to keep a full-time staff person supporting research needed to maintain a directory of Chicago programs and to do site visits and write stories. Hopefully some of our readers will become investors and help us rebuild this capacity. However, this role could be shared by journalism students from different high schools and colleges and by volunteers from PR and advertising firms. Using the Program Locator maps groups could divide up the city and spend time getting to know each program in their area and writing regular stories that would help educate the broader public so more people provide the dollars and talent each program requires. It takes a Village to Raise a Child. It also takes a Village to make sure high quality mentor-rich programs are available to K-12 youth in every poverty neighborhood. 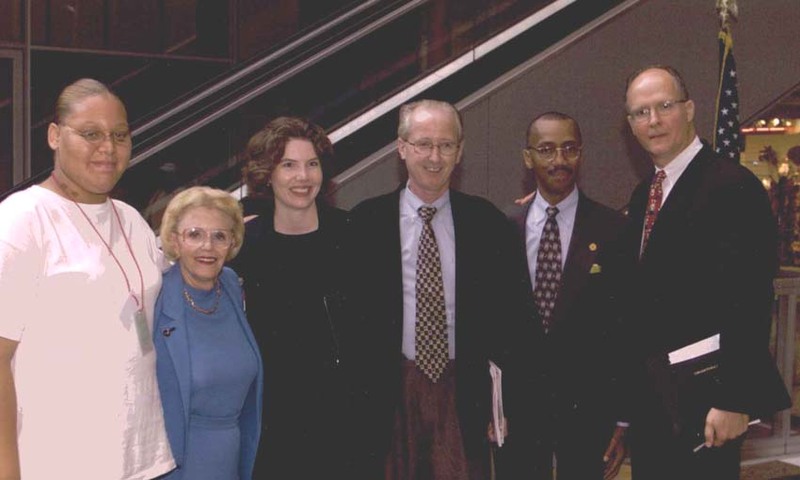 This photo was taken almost 12 years ago during a November 1997 event hosted by the Chicago Bar Foundation and the Lawyers Lend A Hand Program. It's purpose was to raise visibility within the legal community that would help raise money directly for individual tutor/mentor programs in Chicago and for the Lend-A-Hand Program's pool of funds which it drew from each spring to award small grants to 15-20 tutor/mentor programs in Chicago. 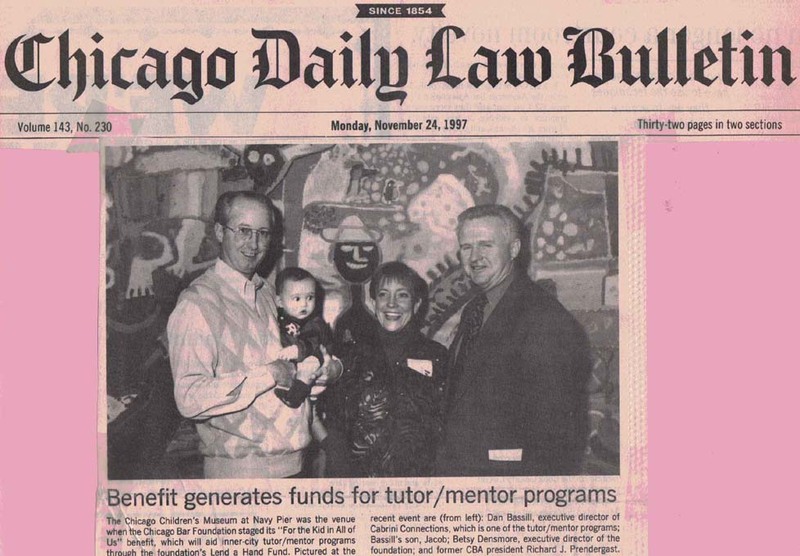 At the right is an article from the Daily Law Bulletin of the Chicago Bar Association, telling about a collaborative effort of the Chicago Bar Foundation and the Tutor/Mentor Connection, intending to raise visibility for tutor/mentor programs in November that would lead to more contributions in the December holiday period. This was all part of a strategy developed in 1994 where the Tutor/Mentor Connection would host a conference in November, the CBF would host a fund raising event, and we would create a "Tutor/Mentor Week" to generate greater visibility for all tutor/mentor programs in Chicago that would help recruit volunteers and donors at that time of the school year. We're approaching the Holiday Season again and volunteer-based tutor/mentor programs still need operating dollars to do their work. 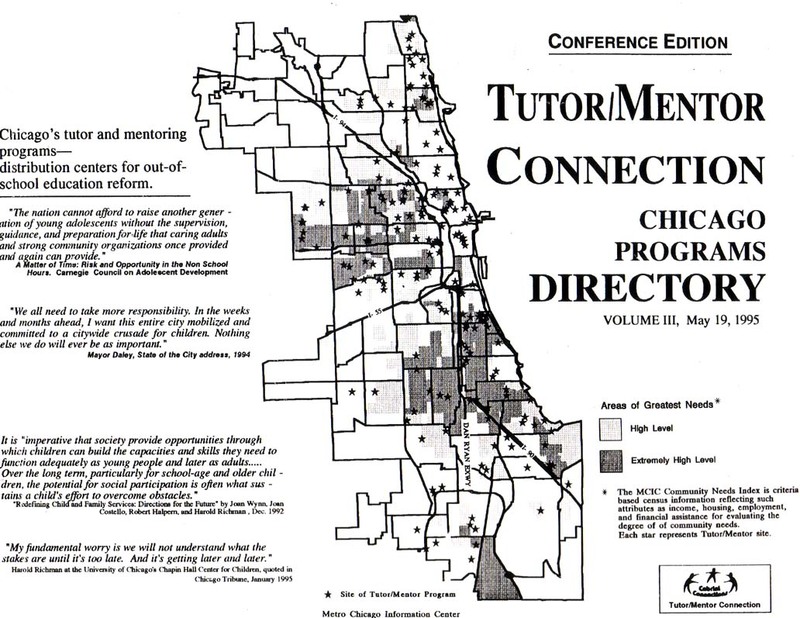 From 1994 to 2001 the Tutor/Mentor Connection published a printed directory that people could use to search for different tutor/mentor programs in Chicago. We never had much money so we were only able to send 300 to 400 copies of this to foundations, media, libraries and the programs listed in the Directory. Thus, it was a big deal when we found a way to put this directory on line in a searchable program locator back in 2004. 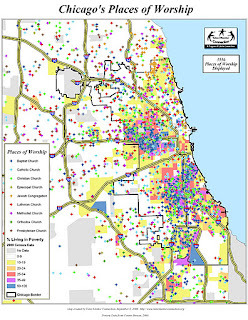 Then in 2009 we launched a new interactive map version where you could look at a map of Chicago and see where tutor/mentor programs were most needed, based on poverty or poorly performing schools, and you could see icons on the map representing existing tutor/mentor programs in our directory. In both of these versions you could sort by age group and type of program and zip code to narrow your search to find contact information on specific types of programs. This service consistently has recorded 500-600 visitors a month for over eight years. 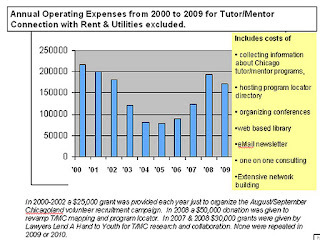 The chart below shows funding available to the Tutor/Mentor Connection in the past decade to do everything it does, including creating and hosting this map based program locator. You can see that we've had less than $150,000 a year which is less than what it would cost to purchase one full page ad in the Chicago Tribune on a single day! 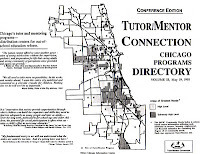 The T/MC operated as part of a combined Cabrini Connections, Tutor/Mentor Connection non profit since formed in 1993. We split money each year between the site based tutor/mentor program and the T/MC, yet the time spent on the T/MC always was secondary to the time needed to support the 70-80 pairs of students and volunteers in the Cabrini Connections program. Due to the financial challenges of the past decade the Board of Directors finally decided that they could no longer support this dual strategy from a single small program, thus voted to discontinue the T/MC in April 2011. 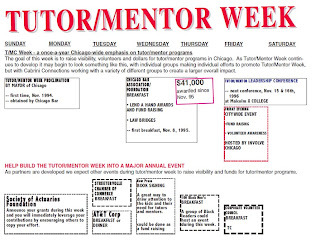 I "retired" from my role of President, CEO in July and created the Tutor/Mentor Institute, LLC in an effort to find new ways to generate revenue and partnership to continue to offer the T/MC to Chicago and to help programs like Cabrini Connections get the volunteers, donors and ideas each program needs to thrive. I did this without any financial commitment other than my own meager savings account. The Lend A Hand Program received a $2 million award in 2006 and has made grants totaling nearly $240,000 per year since 2007. If we can encourage other businesses and professions to launch similar programs it can generate money and volunteer talent from every industry to support tutor/mentor programs in different parts of Chicago. It's a strategy that can duplicate in other cities if an intermediary group like the Tutor/Mentor Connection is available. I want to help make that happen but I need your help to do this. I've never been successful obtaining sponsorships for the conferences from a charitable standpoint and I have no experience approaching venture capital people for the type of investment we need to build out the features and services of the T/MC or to fund an aggressive advertising campaign to raise money for tutor/mentor programs in the Directory. Thus, my first request is for volunteers to step forward and fill the different roles visualized on this talent chart. You can see this live at this link. At the same time I need to raise money for monthly expenses such as hosting the web sites, organizing the next conference, etc. I'm not asking for a charitable donation and I don't have a 501-c-3 structure to offer you a tax deduction for a gift. Instead I'm asking your to help me offer hope and opportunity to inner city youth, and an opportunity for volunteers and donors to be enriched by being part of the lives of these kids. When Jonathan Kozal talked about his book "Amazing Grace" he said the "Amazing Grace is not what we do for them, but what they do for us." You can help me by contributing dollars to help me continue to build the Tutor/Mentor Connection and by helping me find sponsors and investors who might want to put the "name" on the Program Locator or on the Conferences or on our Links Library, just like US Cellular puts their name on a baseball field or rich alumni put their name on college buildings, hospitals and sports stadiums. Associate your name with a vision of helping more kids from poverty move through school and into jobs and careers and you'll have a legacy that can last many years into the future. Twenty years of reform efforts and programs targeting low-income families in Chicago Public Schools has only widened the performance gap between white and African-American students, a troubling trend at odds with what has occurred nationally. Across the city, and spanning three eras of CPS leadership, black elementary school students have lost ground to their white, Latino and Asian classmates in testing proficiency in math and reading, according to a recent analysis by the University of Chicago Consortium on School Research. "If school closings destabilized certain neighborhoods, other efforts were ineffective — millions of dollars pumped into countless after-school initiatives and tutoring and mentoring programs geared toward African-American students, only to see math and reading scores languish and many students fall further behind." I challenge this statement of "countless after-school initiatives and tutoring and mentoring programs". I've been hosting a database of non-school volunteer-based tutoring and/or mentoring program serving Chicago and have been using maps to show where these programs are needed, where existing programs are located, and where more dollars are needed to help programs constantly innovate ways to have a greater impact. I tried to find census maps on the internet today to support this article. 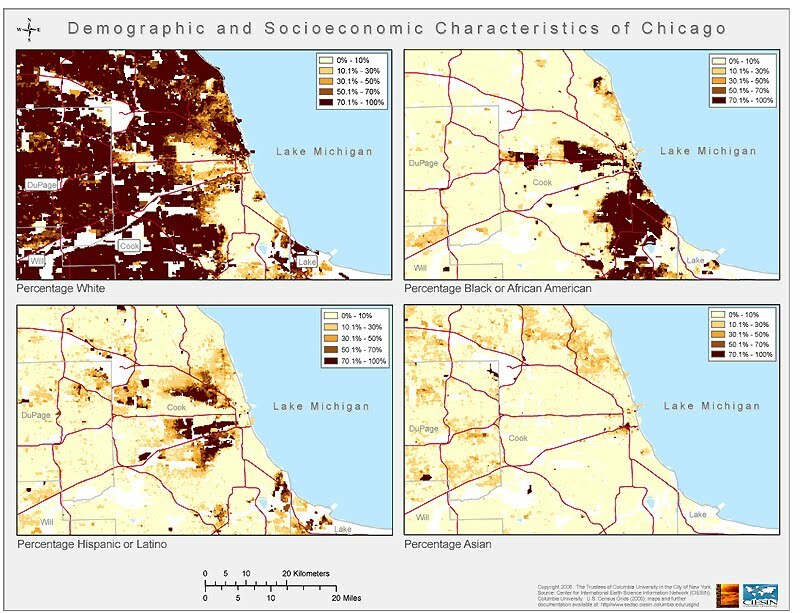 Here's one set of maps showing demographic concentrations in the Chicago region. This is from a U.S. Census Grids web site. Here's a maps showing African American population concentrations in Chicago, created by the Tutor/Mentor Connection in the mid 2000s. On this map we've overlaid locations of poorly performing schools from the 2007 ISBE watch list. 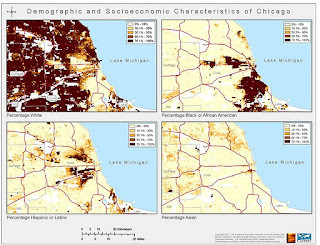 From both sets of maps you can see high concentrations of African Americans living in high poverty areas. You can also see a huge number of failing schools. 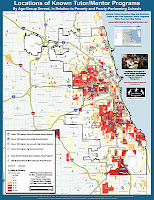 On this next map you can see locations of different non-school tutor/mentor programs in the Chicago area. You just don't see a large number of programs in many parts of this map. I encourage you to use the Interactive Program Locator and create your own map. Sort by type of program and age group served. When trying to understand this information you need to think in layers. What is the distribution of tutor/mentor programs serving elementary school kids? Middle school? High school? In each neighborhood programs serving all three groups need to be equally available? If "millions of dollars had been spent on countless non-school tutor/mentor programs" targeted at African American youth, the map should show many more programs in these neighborhoods than we show. There may be more. This mapping project has never received funding from the city, the schools or major philanthropy. Thus, there may be programs we don't know about and some of our information is out-of-date. Furthermore, there needs to be many more questions asked, to know more about what these programs have in common, how they differ, what they need to find and retain quality staff and financial support, ways they can constantly improve. The Tribune story offers a generalization that makes one think that millions of dollars were spent on a comprehensive tutoring/mentoring strategy. 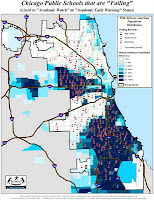 Millions may have been spent, but there is no evidence that any strategy has been used to assure that Chicago has a broad distribution of well-organized and constantly improving non-school tutor/mentor programs in high poverty neighborhoods. This could change if the Mayor, a foundation or an investor were to become a partner and provide financial support to the Tutor/Mentor Institute, LLC so we can update the maps and launch an aggressive advertising campaign to help existing programs get the funding and talent they need to operate in more places and to constantly improve their impact over the next 10-20 years. 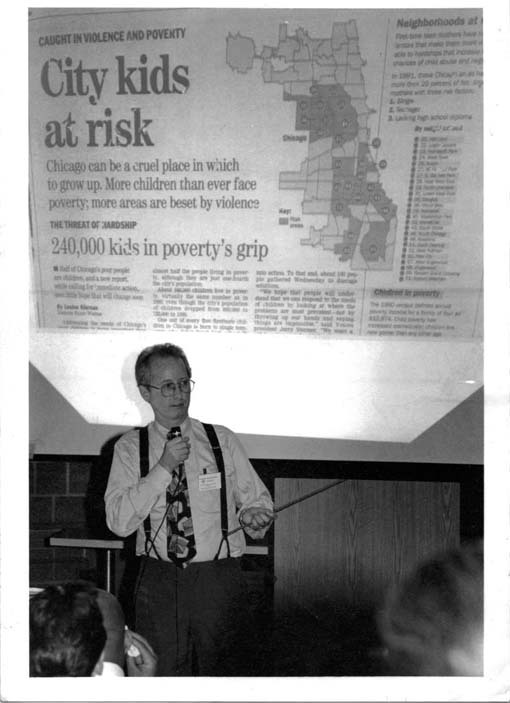 This photo was taken more than 15 years ago, illustrating my long-term commitment to using maps and to supporting the growth of volunteer-based tutor/mentor programs in all parts of the Chicago region. Thanks to donations of software and talent along with a major gift of $50,000 in 2007 you can now use an interactive Chicago Tutor/Mentor Program Locator to find out if there are volunteer-based tutor/mentor programs in different poverty areas of Chicago and you can click on their web site (if they have one) to learn what they do and how to help them. 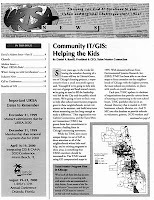 While this use of maps has been featured in various media and publications, I've not been able to find investors/sponsors/benefactors to provide the money needed to keep the maps updated and working properly nor to launch an on-going advertising campaign in Chicago intended to draw more attention to the maps and teach more people to use them. 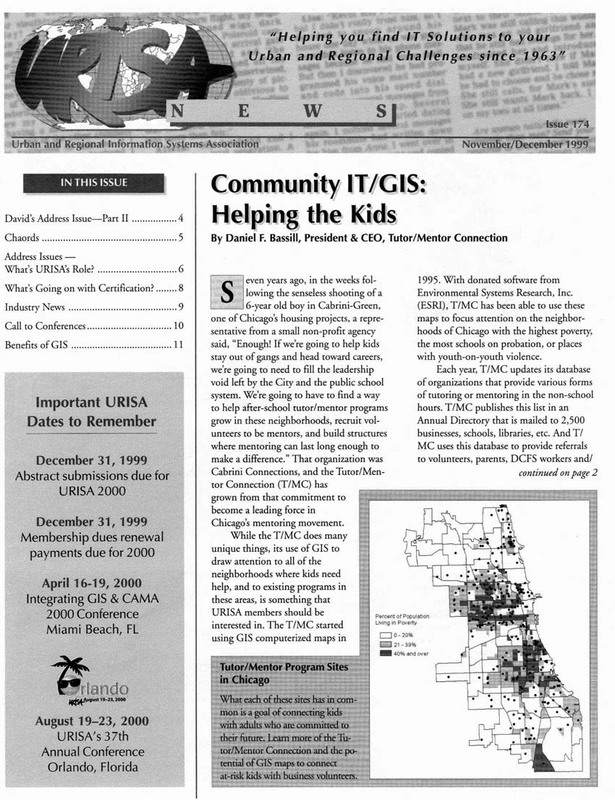 You can view a PDF of the map story printed in the USRISA News. You can also see how our use of mapping idea was recognized by being nominated for a 2004 Award by the Institute for Social Inventions of the Global Ideas Bank. Yet, due to economic factors, lack of leaders and plain bad luck, we're operating at a minimal level of support to keep this service alive. If you want to help support this work please send a contribution. Read more. If you'd want to become a partner to help develop this capacity, or want to have "naming rights" to the Program Locator, the Tutor/Mentor Conference or the Tutor/Mentor Institute library, email me at tutormentor 2 @ earthlink dot net. 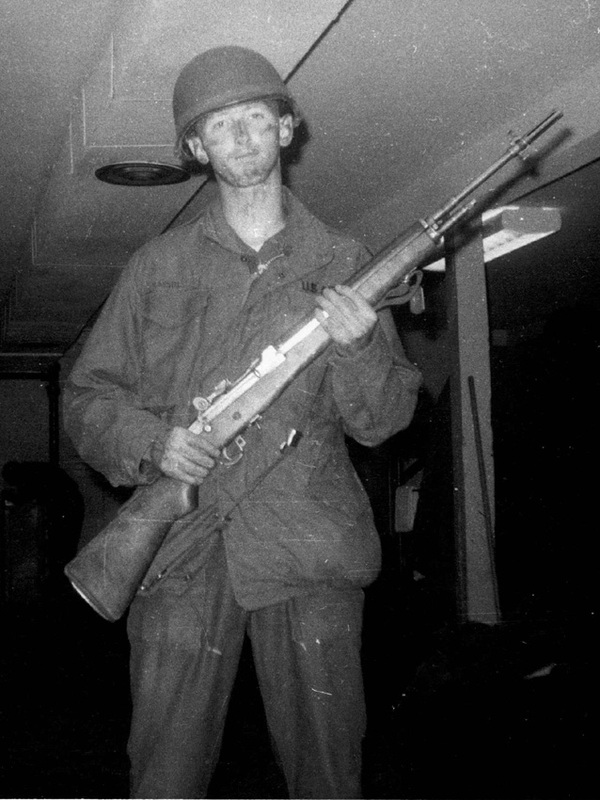 This is me, in the fall of 1968 during basic training at Ft. Polk, LA which was the home of infantry being trained to go to Viet Nam. 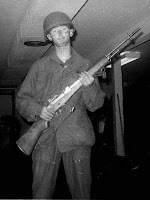 Lucky for me, I joined the Army in the summer of 1968 after getting a degree in history from Illinois Wesleyan University. I enlisted with a guarantee to be trained to be a SPY! Instead of the infantry I went into Army Intelligence. I spent a year in Baltimore and Washington, DC and then a year in Korea. It expanded my vision of the world and set the groundwork for what I've been doing in the 40 years since then. I was one of the fortunate ones who did not get wounded or killed by the conflict in Viet Nam. In 2001 I was given an honorary PhD from Illinois Wesleyan, in recognition of the work I had been doing to help inner-city youth connect with tutors/mentors and experiences beyond the high poverty neighborhoods they were living in. This work has continued to develop over the past 10 years even as the resources to do it has continued to shrink. I've combined my passion for history and my experiences in Army Intelligence and 17 years of Retail Advertising with the Montgomery Ward Corporation into a market-based strategy aimed at helping mentor-rich non-school organizations reach youth in all high poverty areas of Chicago. This is one of the graphics I've created to illustrate the ideas I'm sharing. In the military every General knows that the troops in the field are only as strong as the supply chain that makes sure they are well trained, well armed and well fed...and in the right location. See the story I wrote about this in June 2008. In business leaders use this thinking all the time to put stores in places where customers can easily reach them. They make sure stores have well-trained staff, merchandise that people want, and they use massive advertising to prompt people to shop on a regular basis. No such system exists in the tutor/mentor world or in most of the social sector. The "intelligence" needed to gather and analyze data about what programs exist and where they are needed is not funded in any consistent way. The work needed to train young people to be leaders of tutor/mentor programs is not being done at any major college (that I know of). The millions of dollars of advertising needed to draw volunteers and donors to individual programs on a regular basis does not exist. 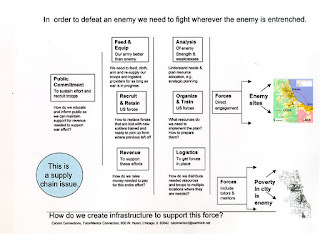 Thus, the battle-plan needed to win the "war on poverty" is still needed in cities throughout the world. I would like to encourage Veterans and those who support our men and women in service to spend time today reflecting on what I've just written. 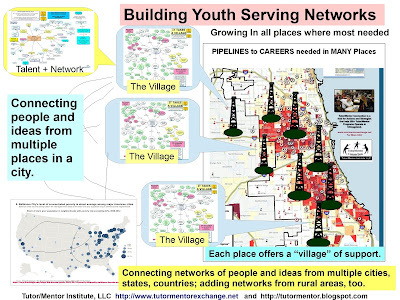 Do you have a "battle plan" to reach youth in your community with long-term, mentor-rich programs that assure that more of them will be in jobs and careers and capable of adult responsibilities by the time they are in their mid to late 20s? Who is doing the "intelligence" gathering for you? Who is doing the advertising? Who is paying for this? "Insanity: doing the same thing over and over again and expecting different results." Attributed to Albert Einstein. I've been writing this blog since 2005 and I've been trying to help volunteer-based tutor/mentor programs grow in the Chicago region since 1993 when I created the Tutor/Mentor Connection. Over the years I've developed a strong belief that traditional "beg for gift" philanthropy is an ineffective way to generate the continuous flow of resources and the high levels of talent needed to operate a single tutor/mentor program, let alone enough to reach 20-30% of the kids living in high poverty neighborhoods of Chicago. a) create information about existing programs, where they were needed, what they do, how they differ, who funds them, etc. While I've had many people give positive feedback I've not found philanthropic investors to provide the capital needed to build organizational strength that would make what I was doing as effective as it needs to be. Part of that was because of an inability to keep donors involved for multiple years. Part of that was due to not having volunteers with enough civic reach involved in this effort. Part of it was not having the resources for advertising and public awareness. I started following the blog articles written by Dan Pallotta a few years ago. I have a link to them on this web site. I saw references to a book he wrote titled "Uncharitable" but I never had time to read it until I picked it up at the library a couple of weeks ago. I'm not completely through but in reading it I can see many reasons why I've not been able to find the financial and leadership support I've needed for the past 18 years. If you have read my blog articles you see I point to the ideas of other people via web links and blog exchanges. The first commitment of the T/MC was to "collect ideas created by other people and to try to get greater circulation of those ideas so more people understood them". I don't need to originate an idea. If it's good, I just need to find ways more people will look at the idea and try to understand it. I think Dan Pallotta has some good ideas. Some are so controversial that they can keep you from thinking through some of the other ideas. That's why I've created a map of the chapters of the book. While you're having difficulty getting past some of the first ideas you need to be thinking of some of the other ideas. So as I'm still moving through the last chapters of Uncharitable I'm saying "How can I help more people begin to read and reflect on this book" so that over a period of years we might build a sub-culture of people who think differently and act differently. We don't need to change everyone. We need to change a small percent of everyone. I've not dug into this deeply so if you know of people who are doing what I'm describing, please post a comment and share a link. In his book Pallotta sort of bashes religion for some of their practices regarding charity. Yet, I think that if someone were to take the various sound bytes out of Dan's book and create a 52 week lesson plan, it could be connected to the 52-week lesson plan of any faith group and included in weekly discussion groups just like people read a passage of scripture then sit and discuss it with small groups of other people. 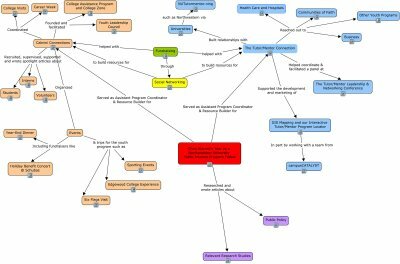 I created a concept map outlining chapters in Uncharitable and put links to some of Dan Palotta's blog articles, as well as to some written by others. I'd like to find a group who would take ownership of this and put it in a format like Debategraph.org where others could add new links whenever they want. Obviously I have a self interest in this. I'm trying to find capital that I can invest in the ideas I've generated over 20 years which I think would help an entire industry of volunteer-based, mentor-rich organizations become available in high poverty neighborhoods. I need to find investors who share the vision and are willing to invest in long-term solutions that start with the building of information libraries and interactive technology portals. I've outlined many of the ideas I'm trying to develop in this wiki. Thus, my goal in bring attention to "Untouchable" is to build a sub-set of leaders and volunteers and investors who will apply these ideas to support my own efforts and those of leaders in hundreds of youth serving organizations throughout the world. I look forward to connecting with others who have been thinking of ways to change the insanity of what we've been doing now to support our efforts. NOTE: in the comments I've added updates to this post, reflecting additional thinking on this topic. I've been sending the following message to volunteers who hosted workshops last Friday at the Tutor/Mentor Leadership and Networking Conference in Chicago. Thank you again for presenting a workshop last Friday at the Tutor/Mentor Leadership and Networking Conference and for helping me promote the event. About 85 people participated from 45 different organizations. Since 1994 when we launched the conferences more than 1,000 different organizations have been represented. At http://femioutreach.blogspot.com/2011/11/tutor-mentor-conference.html you can see how one participant has written about her experience at the conference. The photo above is of me and Tramaine Montel Ford, who was a keynote speaker at the conference. Tramaine and I have been connected since the mid 1990s when he was a student at the Cabrini Connections program. If we can encourage this type of blogging and information-sharing from every participant we can attract more attention to the challenges and opportunities of tutoring/mentoring and do more to build the resources needed for programs to constantly innovate ways to improve. Attached are the evaluations that were turned in for your workshop. (each presenter was sent PDF copies of their evaluations). Each speaker was also encouraged to join in the online forum at http://tutormentorconnection.ning.com and http://debategraph.org/mentoring_kids_to_careers with the goal that we connect to each other and many other people in more depth during the months between conferences and that this motivates more people to come together every six months when we do host future conferences. I’ll be sending out a conference survey via email to gather feedback. I hope you’ll take a few minutes to respond. There is much to do and not enough time and money to do it all. I hope you’ll continue to support this effort. While we connected a small group of people last week this group can become an army for making good things happen if we can connect in on-line communities and add others to this effort. Where are the Good Shepherds? I encourage you to read today's John Fountain column in the Chicago SunTimes. It is titled "In time of crisis, where are the good shepherds?" It starts out with "I hear you, man. . . . But the people perish. And yet, the clergy flourish." It concludes with "I pray, dear pastor, that you will be part of the promised wind of change and restoration. For the people perish." 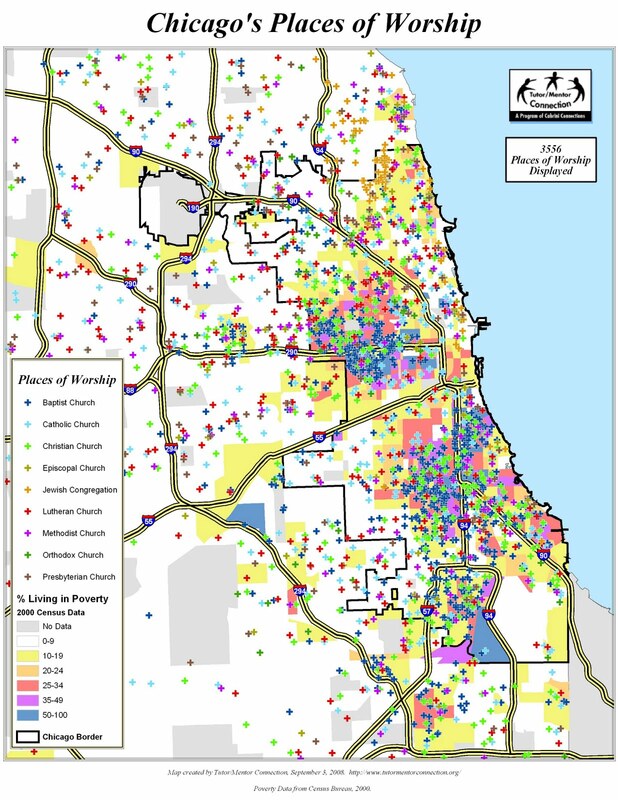 Between Jan 2008 and March 2011 I was able to create a set of maps showing the location of faith groups in the city and suburbs. I have maps for each different denomination. This one shows them all. Staggering how many there are and we only mapped some of the major denominations. Our purpose was to provide a tool that faith leaders might use to support the growth of mentor-rich non-school tutor/mentor programs in high poverty neighborhoods. I created this PDF guide for Faith Leaders with the goal that one or more would adopt it and set an example that others would follow. Here's an article I wrote several years ago for the Ecumenical Child Care Network. The faith community has one of the most powerful communications networks in existence. If we can encourage and nurture the growth of learning circles and study groups at different churches, synagogues and mosques those groups can take ownership of the Tutor/Mentor Connection strategy and carry it to new levels of impact in future years. I would love to enlist Mr. Fountain to help me evangelize this message so leaders in different faith groups adopt it. Perhaps in future Tutor/Mentor Conferences he could give awards and recognition to faith leaders who begin to adopt this strategy. I'd also love to enlist the Cardinal and other faith leaders. There is a 'promised land' and with the help of a few prophets we can show others a path to get there. Today's Chicago Tribune has a feature showing that truancy is rising in Chicago area schools, which contributes to poor performance, high drop out rates, and a high cost to society and to the young people involved. One school shown with 56.9% of students chronically truant was Robeson High School, located at South Normal Boulevard on the South Side. 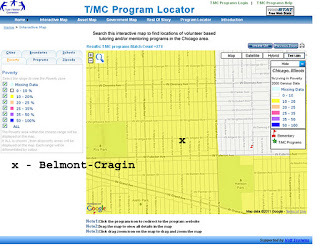 I used the http://www.blogger.com/img/blank.gifChicago Program Locator's Interactive map to zoom into this neighborhood and created this map. This map shows that there are three organizations trying to reverse this trend in the area around Robeson. One is the Yancy Boys & Girls Club which has developed a partnership with Big Brothers Big Sisters of Metropolitan Chicago. A second is the By the Hand Club for Kids, who on their web site show some impressive statistics. I did a second map showing the area of Belmont-Cragin Elementary School, located in the Central part of Chicago. This map required a little more effort to make because this school was not included on the 2007 or 2008 list of low performing public schools, thus it's not included in the map on the Program Locator. Since the Tutor/Mentor Connection has had no public or private funding to support this mapping project since a $50,000 gift from an anonymous donor in late 2007 we've not been able to keep updating the mapping and now we have no staff at all to support this resource. 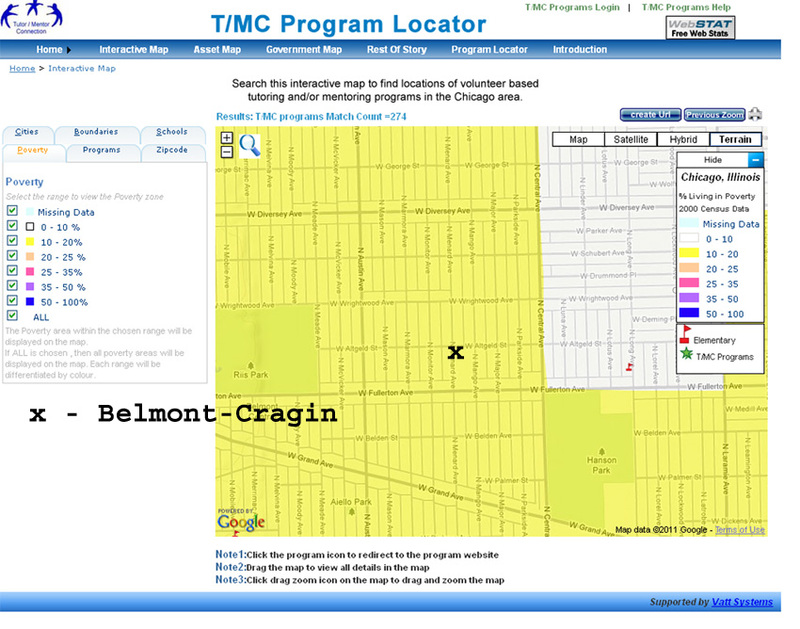 Thus I placed an X on the map to show where Belmont-Cragin is located. You can see that while there is a medium rate of poverty in the area (based on 2000 census info) there are no tutor/mentor programs in the area around the school. If you use the Asset Map feature on the Program locator you could determine if any churches, hospitals, banks or colleges are in the area, who could be helping start such programs. I have been collecting information about tutor/mentor programs and using maps to show where they are needed and where existing programs are operating since 1993. My goal is to help existing programs connect and learn from each other while creating public attention that would draw more donors and volunteers to support the existing programs or to help new ones form where they are needed. I have hosted a Tutor/Mentor Leadership and Networking Conference every year since 1994 to encourage programs to network and share ideas. Obviously the Boys & Girls Clubs, Big Brothers Big Sisters and By the Hand Club have some expertise they could share with others....if they were to make time to participate in the conferences. There are many organizations in Chicago who have much to share, and much to learn. We all need more resources to support the work we do and constantly improve based on what we learn from our own efforts and the efforts of peers. Yet if we can't find time to connect and share ideas and work together to build the pool of resources available to do this work, it's unlikely that we'll ever have more than a few good tutor/mentor programs working to help more youth succeed in school and in life. Here's an email sent by one of the workshop presenters who will be sharing information at this Friday's Tutor/Mentor Leadership and Networking Conference in Chicago. Ithttp://www.blogger.com/img/blank.gif's an example of how others can take a role in bringing people together at the May and November conferences. 77 W Jackson Boulevard in Chicago, Illinois. I ask us to spread the word and to think, What do we truly want to learn? The conference is organized by Daniel Bassill. At this time, it costs $80. The goal is to connect leaders and supporters of volunteer-based tutoring, mentoring and education-to-career programs, especially in the Chicago area. I got involved because of my interest to make a living from a Learning Club. http://www.brainfuse.com to help students with their homework through a system of chat, white board and lessons. The advantage of that work is that I can likely do it from anywhere, including Lithuania. However, I'd like to find a more meaningful way to make a living. I like the idea of a Learning Club where I would meet on an ongoing basis with twenty or more families to help them learn. They might pay $50 per month. I believe that we can develop an education system based on what people truly want to learn. I can also apply my creative skills to create learning materials in the Public Domain for Math, English and other subjects. If I could make a Learning Club work, then potentially there could be thousands or millions of people making a living from them and transforming our education system and even our economy. I currently have one student, an adult learning math, and she's happy. The major obstacle is finding a place where such a Learning Club would be welcome, given that I wish to make a living from it. I entitled my workshop, "Nurturing the Art of Self-Learning", but I think more to the point is the question, "What do we truly want to learn?" Daniel Bassill's goal is to open up career opportunities for disadvantaged youth and young adults. I don't believe in careers, in the traditional sense, and I don't look to them as solutions for our society. Instead, I wish that we could learn what we truly want to learn, and learn alongside each other. Likewise, I do think that we exhibit different levels of maturity as self-learners. Yet instead of formalizing roles of "tutor/mentor" and "student", I prefer to learn alongside each other, as much as possible, and work towards a culture where we are all learning and helping each other learn. One thing that I'm discovering as a chess instructor is that I can keep attentive 10 or more youngster of different grade levels (1st through 5th, say, or 3rd through 7th) by teaching as deeply, profoundly as possible, so that not everybody understands everything all the time, but their not bored, and the deep ideas grow in their minds like seeds, springing to life later on. * What is your deepest value in life, which includes all of your other values? * What is your dream in life? * What do you wish to achieve? * What lessons can you share? I'm making a poncho on which I'm painting a backdrop based on my diagram of some 40 questions asked by participants of Occupy Chicago. http://www.occupyme.net/chicago/wiki/Ask/Everybody I'll be able to include (with velcro) our "questions that we don't know the answer to, but wish to answer". We'll discuss synergies that suggest themselves, including those that might relate younger and older people. * We don't believe that others could care about what we do. This is a big problem! We'll discuss how art projects can help us engage each other. * We can't make a living from such activity. And if we could, then others would refuse to help us be "profitable". I hope to learn from our discussion, both online and at my workshop!